On this page you can find measurements and information about things to consider when you choose a size or length for your rope tack. Since I make all my products by hand their actual measurements can vary slightly from the measurements listed here on the website, I am however very meticulous and always try my best to make your tack as exact as possible. Please note that I make all my products in meters and centimeters. The foot and inch measurements listed on this page are only for comparison and have in many cases been rounded to the nearest foot or inch, so the items you buy might not be exactly the same length in feet or inches as listed here. The most important measurement to know when you buy a rope halter is the nose circumference, meaning the distance around your horse's nose where the noseband will sit. The noseband should sit a few centimeters below the horse's cheek bones (small bulges on each side of the horse's head). 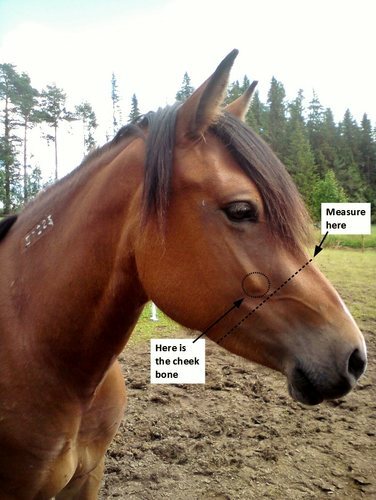 In the picture below you can see where the cheek bones are and approximately where you should measure to get the right size for your rope halter. Rope halters should fit rather snugly when they are new. When I make your rope halter I tighten all the knots by hand but when you receive your halter and start using it the knots will get even tighter and the halter will become slightly larger. It is not the rope that stretches, only the knots that get pulled tighter since your horse is a lot stronger than I am. In order for your rope halter not to become too large after a while you should choose a size that has a roughly 5 centimeter (2 inches) larger nose circumference than your horse. This is however just an approximation and can vary depending on the size of your horse, what type of rope halter you plan on buying and so on. If you want a halter with extra nose knots or a braided noseband you generally need a somewhat larger nose cirumference, since the nosebands on such halters do not fit as close to the horse's face as other types of halters, and in such cases you might need to choose a larger size than you normally do. Below you can see how large nose circumference the rope halters I make have in each of the 7 sizes. If you are unsure which of two sizes you should choose I recommend that you choose the larger size to ensure that your halter will not be too small. The lengths 3,70 and 6,70 meters are equivalent to 12 and 22 feet respectively, which are two of the most common lead rope lengths in natural horsemanship, so if you prefer any of these specific lengths I have those as well. If you would rather have some other length than those listed here you are welcome to contact me and I will gladly custom-make a lead rope according to your specific requirements, whether you want a lead rope that is 15 meters, 4,99 meters or any other length. If you normally buy reins in sizes and do not know what length you need in meters, pony sized reins normally measure around 2,40 - 2,60 meters, cob 2,60 - 2,80 meters, full 2,80 - 3 meters och X-full about 3 - 3,20 meters. This varies a lot between brands however so I recommend that you measure a pair of reins that you know are the correct length for you and your horse, that way you will have a better idea of what length you should buy. And if you need some other length than those available here on the website I can always custom-make reins in any length you want. The most common lengths for split reins are 7 and 8 feet, which are equivalent to my length options 2,20 and 2,40 meters. 2,20 meters generally suit large ponies and small horses and can roughly be considered cob size, whereas 2,40 meters tend to fit somewhat larger horses and thus is similar to full size. If you have a small pony I recommend that you choose 1,80 or 2 meters and if you have a very large horse you might need 2,60 or 2,80 meters. What length you choose for split reins is however very individual and does not only depend on the size of your horse but also your own personal preference as a rider. To calculate what length you need you simply add the rein length you need and the lead rope length you want, plus another 2 - 3 decimeters to tie the mecate rein (exactly how much extra rope you need depends on how you plan to attach the rein). That gives you roughly the length you should choose. You need reins that are 3,20 meters long and want a lead rope that is 4 meters long. 3,20 m + 4 m + 0,30 m = 7,5 m. That means you need a mecate rein that is approximately 7,5 meters long. For driving reins 8 meters is generally a good length for ponies and 12 meters for horses. Reins for ground driving should be somewhat longer, for horses 16 meters is a fairly common length. Exactly what length you find suitable for long reins is however very individual and also depends on your own personal preference. Finding a bridle that fits your horse is not so easy, especially since sizes vary quite a lot between different manufacturers. To know what size you should choose when you buy a rope bridle from me you can measure the distance over your horse's poll from bit ring to bit ring when it is wearing its usual bridle. Then compare the measurement you get with the lengths in the table below and check which size you get closest to. The lengths from bit ring to bit ring in the table below refers to the normal length of the headstall, you can then make it shorter or longer to precisely fit your horse. The length of the throatlatch is the same as the length between the bit rings and refers to the normal length of the throatlatch all the way around the horse's neck, but the throatlatch is of course also adjustable. In the table below you can also see how long the browbands are from end to end (their total length, that is). The browbands I make are slightly longer than the browbands on regular English leather bridles since the loops that the headstall and throatlatch run through are longer on my rope bridles than on leather bridles. When you buy a rope bridle from me you should therefore have a browband that is about 4 centimeters (1 1/2 inches) longer than what you normally have on leather browbands. If you want a browband for your rope halter it should also be a few centimeters longer since a halter normally sits slightly further back on the horses neck than a bridle. Like rope halters with braided nosebands, the braiding makes the nose circumference of the bosals slightly smaller than the measurements above but since you normally place a bosal somewhat lower on the horse's face than a rope halter you should be able to have the same size on bosals as you have on rope halters. If you need some other length I can of course custom-make a neck rope for you with the exact length you want.